Based on a graphic novel by Brian Augustyn and Mike Mignola, 2018’s Batman: Gotham By Gaslight views the Caped Crusader circa the end of the 19th century. As is the case in the modern era, this period’s Bruce Wayne (voiced by Bruce Greenwood) operates as local mogul while his alter ego Batman prowls the city at night to remove the criminal element. Into Gotham steps a serial killer who preys on women. He gets the nickname “Jack the Ripper” and Batman attempts to stop him. Given the fact Batman came into existence nearly 80 years ago, we’ve seen the character in a mix of periods, but those were usually current at the time. 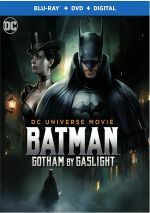 Gaslight comes with an “alternate reality” feel as it lets us see how the Dark Knight would operate in a time that predated his actual creation. While I can’t claim to love this kind of “what if?” scenario, I do think it comes with some intriguing possibilities. Does Gaslight exploit these in a satisfactory manner? Meh. While Gaslight boasts a few fun moments, too much of it feels like a slew of gimmicks packed into a movie. Maybe because that’s essentially what it is. “Batman Vs. Jack the Ripper” feels an awful lot like fan fiction, and not especially great fan fic at that, as the notion seems fairly contrived. Much of the potential entertainment value found in Gaslight comes from basic recognition of the characters in these alternate circumstances. Plenty of well-known personalities show up in small doses, and these moments exist more to tease/please fans than to suit the narrative. Not that Gaslight offers an especially great story anyway, as it tends to rely more on its novelty than a strong plot. Because the film wants to indulge so many references to established Bat lore, the action pursuit of Jack feels nearly secondary, so that side fails to become particularly involving. Though it boasts decent artwork, the choppy animation of Gaslight becomes another distraction. While I don’t expect feature-quality work, the jerky, stiff nature of this material robs the material of the needed fluidity. I don’t want to come down too hard on Gaslight, as it usually musters acceptable entertainment despite its flaws. Still, the end result feels spotty and without a lot of real excitement or drama. 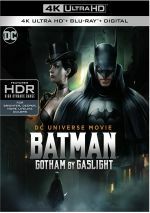 Batman: Gotham By Gaslight appears in an aspect ratio of approximately 1.78:1 on this Blu-ray Disc. I felt consistently pleased with this strong presentation. No issues with sharpness emerged. The movie always came across as tight and well-defined, so don’t expect any signs of softness. In terms of colors, Gaslight went with a dark palette that favored browns, blues and reds. The tones looked solid, as they showed positive richness and vivacity. Blacks were deep and tight, while shadows showed nice clarity. Across the board, the image worked well. I thought the DTS-HD MA 5.1 soundtrack of Gaslight opened up the comic book material nicely. This wasn’t a particularly ambitious piece, but it added pizzazz to the program. The forward channels brought out the majority of the material. Music presented strong stereo imaging, while effects cropped up in logical spots and blended well. These instances mainly occurred during storms or bigger action scenes. The back speakers brought out a nice sense of space and environment. Music sounded lively and full, while effects displayed good definition. Those elements seemed accurate and dynamic. All of this led to a positive presentation that deserved a “B”. We get a smattering of extras here, and we open with an audio commentary from director Sam Liu, writer Jim Krieg and producer Bruce Timm. All three sit together for a running, screen-specific look at story/characters and the adaptation of the source, animation and design, cast and performances, music, and related topics. For roughly the film’s first two-thirds, this proves to be a very good commentary, as the three men seem engaged and informative. After that, they remain chatty but they reveal less useful material and veer more toward happy talk. Still, the track offers enough content to merit a listen. A featurette called Caped Fear: The First Elseworld runs 20 minutes, 45 seconds and includes notes from Timm, Krieg, graphic novel writer Brian Augustyn, DC Entertainment VP Ames Kirshen, and DC Entertainment Creative Director Mike Carlin. They cover the source comic and its adaptation. We get a reasonable overview in this fairly efficient piece. The disc includes three previews, and we begin with a Sneak Peek at Suicide Squad: Hell to Pay. The only new preview here, this one goes eight minutes, 33 seconds and offers info from Liu, Carlin, voice director Wes Gleason, surviving producer James Tucker, and actor Christian Slater. We find an overview of Hell with an emphasis on promotion. That makes it limited in terms of appeal. Next we get a Sneak Peek at Batman: Bad Blood. This goes for 11 minutes, 45 seconds and includes comments from producer Tucker, Carlin, director Jay Oliva, and actors Jason O’Mara, Yvonne Strahovski, Ernie Hudson, and Gaius Charles. We learn about story/characters as well as cast and performances. This serves to promote the movie and that’s about it. These reels finish with a Sneak Peek at Justice League Dark. During this eight-minute, 14-second piece, we hear from Carlin, Tucker, Oliva, O’Mara, and actors Matt Ryan and Camilla Ludington. It’s another ad for the project, so we don’t learn a lot about the production. The set provides two bonus cartoons. From Batman: The Brave and the Bold, we get “Trials of the Demon!” (22::58), and from Batman: The Animated Series, we find “Showdown” (21:19). The two shows contrast due to style, as the semi-campy Bold seems very different from the more serious/relatively dark Animated Series. Still, both offer entertainment and add value to the set. Under trailers, we find a promo for Batman Vs. Two-Face. No trailer for Gaslight appears here. As a 19th century take on Batman, Gotham By Gaslight offers moderate entertainment. However, the movie feels too gimmicky and plot-thin to become anything particularly compelling. 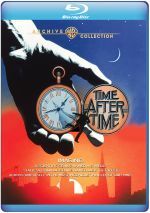 The Blu-ray offers excellent visuals along with good audio and a selection of supplements. Expect a pretty average Bat tale here.